What is the Ace’s value? The Ace is a powerful tool for any successful hand because of its unique flexibility to count as either one or 11 points, at the player’s discretion. All learned blackjack players know we need to use this card wisely, and not let it go to waste. Required to form a natural two-card blackjack in all variants of the game (and thus a higher pay-out), the Ace is the pillar of the game of 21. A natural blackjack will always trump the dealer’s hand, or possibly force a push (otherwise known as a tie) if the dealer also draws to blackjack. And the Ace’s flexibility to be valued at either one or 11 points can be used according to which value is most advantageous for us, and this should not be taken for granted. A hand with an Ace is known as a “soft hand” based on the fact that if we hit, we cannot bust. For example, if we hold an Ace/Four (five or 15 points in total) as our first two card dealt, it is impossible to bust by drawing another card, because if we drew a card valued at 10 points, we would simply give the Ace a value of one, for a hand total of 15. If we drew another Ace from the Ace/Four hand, such a hand could total either six or 16. Drawing an Ace and a high-valued card such as a Seven, Eight or Nine give the player a strong starting hand, and needs to be played based on what the dealer is showing. It is important to play to the Ace’s strengths, but also be aware of the potential danger we face when the dealer shows an Ace; it’s equally as deadly a weapon when used against us. If we draw two Aces, our first course of action is to always split them. While the Ace is a powerful card on its own, if we are dealt a pair of Aces on our first draw and opt to keep them together, their combined total value is either two or 12 points. While drawing another card would not bust our hand, starting with a soft-12 is a much poorer hand with much weaker odds of winning, than beginning afresh with two new hands which both have the potential to draw to blackjack. While we are required to place another bet equal to our original wager when we split our cards, it is well worth the money, as we stand in a much stronger position than before. And should we win, the payout will be greater. Keeping the Aces together wastes the inherent value of the Ace card by itself. Always split them to have the best possible chances of bettering your hand. Because the decision to split a pair of Aces is universally agreed upon, because of the favourable odds such a move hands the player, casinos employ certain rules to counter its effectiveness. If we split our Aces and draw a 10-valued card to achieve blackjack with either hand, many land-based casinos enforce the rule that such a hand is not considered a natural blackjack, and therefore, we are not be entitled to the usual 3 to 2 payout; instead we only receive a 1 to 1 payout. We have more freedom playing online simply because of the vast range of different games with different rules, but there are still quite a few variants which enforce this rule, so be mindful of it before you let rip at not scoring a bigger return from your hard-earned 21. Another rule which can counter the effectiveness of split Aces states we are only allowed to be dealt one additional card to each Ace, with no allowance for hitting (just like if we were to double down). This significantly hurts our chances if we are dealt two lower cards, such as a Deuce and a Four, two our Aces, giving us totals of 13 and 15 respectively, and leaving us with no other option but to stand. Again, with the flexibility of online gaming, try to play games of 21 which do not own such a rule. One other rule which is far less enforced but still exists, is the simple rule which dictates players are not permitted to split Aces, full stop. There are subtypes of blackjack where this regulation is imposed. Steer clear of such games. Using an Ace to its full potential is a key part of basic strategy. Whenever we are dealt an Ace, it is important to take note of the dealer’s up-card before we proceed (as it is with any other card). To understand what moves we should make with any hand containing an Ace, familiarise yourself with basic blackjack strategy here. Exploiting an ‘Ace rich deck’ is a tactic used by many gamblers. A single standard deck has 52 cards, and there is one Ace for every thirteen cards. Should we be playing a single deck game, we should take note if no Aces appear in the first deal of 13 cards, or if even luckier, the second or even third deal of 13 cards. If such a scenario arises, we tend to call the deck an Ace rich deck, as none of the four Aces have yet been dealt. If no Ace card shows in the first 13 cards dealt in a single-deck game, we should double our starting bet, and raise it again by around $5-$10 for every subsequent 13 cards dealt without an Ace. While this rare situation gives us only a slight boost in our odds, it should be taken advantage of whenever possible so as to potentially net us more bang for our buck. We here at blackjack.com.au like to personify the Ace. Whenever we see that first letter of the alphabet appear on a card, we get excited, and more often than not, we reap the rewards of being dealt an Ace. So it’s only fair we pay tribute to her beauty. Her value is unique, akin to no other card, and in the game of blackjack, if we are ever so lucky to be dealt a pair of Aces, split them apart so they don’t get jealous of one another. Naturally, there is an increased risk when splitting, as we need to double our bet to create two hands, but she’s worth every penny. The term Ace first began in dice games rather than card games, and was used to refer to the side of the dice with only one dot. 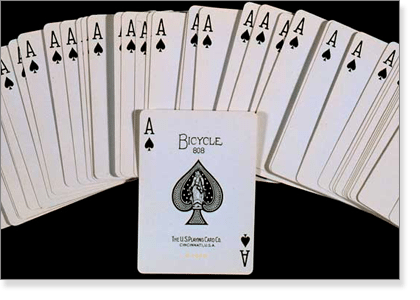 Ironically, in the earliest forms of card games and card gambling, the Ace was considered useless. It had the lowest value of all cards and was the worst one to draw. This is a far cry from its high value today. When the French game of Vingt-et-Un (meaning twenty-one), came to America via French colonists, it helped to change the way Aces were perceived and used in blackjack, by shifting the previous perception of royal cards as being the best cards, especially following the beheading of King Louis XVI. French gamblers, who felt it was politically incorrect for the royal cards to continue being considered high-value, replaced their crowns with personified representations of the ideals of democracy, liberty and honesty, while raising the Ace – considered now to be the personification of the common man – to the highest value. It has retained its status until this very day.